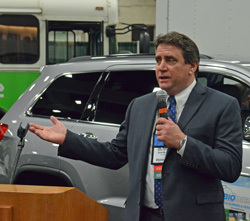 During the 2014 National Biodiesel Conference, Hino Trucks showcased their new game-changer: the Hino COE 195h hybrid truck at the Vehicle Showcase. The COE 195h is making its mark in the medium duty truck segment running clean and quiet on B20 biodiesel blends and electric power. Hino Trucks’ Spencer Nicol is the senior manager for Hino’s Strategic Product Applications. Spencer talks about how using the B20 reducers your carbon footprint and he can’t wait to see it throughout the Midwest.